The Activity Log for MainWP extension allows you to access the WordPress activity logs of all child sites from one central location – the MainWP dashboard. It also keeps a log of all the changes you, your users and customers do on the MainWP dashboard and child sites. This getting started guide explains how to setup the activity logs on your MainWP dashboard and network of child sites, so you can keep a log of everything that happens. 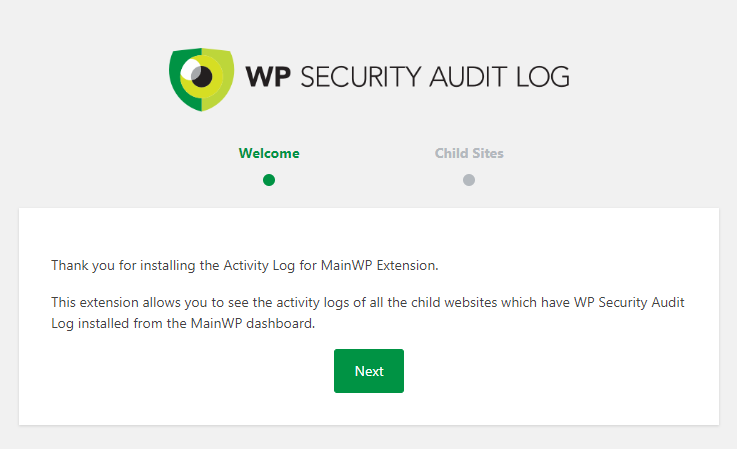 First you have to install the WP Security Audit Log plugin on all the MainWP child sites you would want to keep a log of. You can push the install from the MainWP dashboard or directly install it on the child site. Refer to this getting started guide for information on how on the WP Security Audit Log plugin. 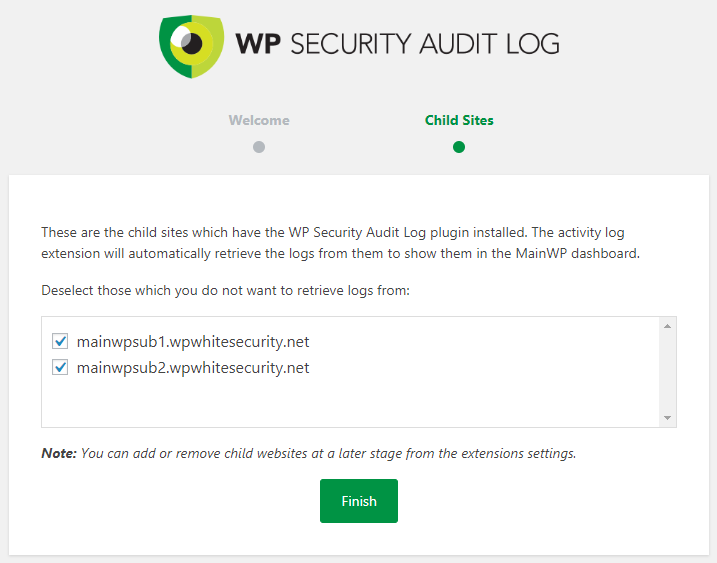 Note that if the MainWP Child plugin is already installed on the child sites, the activity log plugin will be installed in MainWP Child Site Stealth mode, so only you know that WP Security Audit Log is installed and only you can access the activity log. Once the plugin is installed it starts keeping a log of all the changes without requiring any manual intervention. Click Activate Plugin once the plugin is installed. When the activity log extension is activated for the first time you are greeted with a two-step wizard. Use the wizard to select from which of the child sites you’d like to see the activity log in the MainWP dashboard. 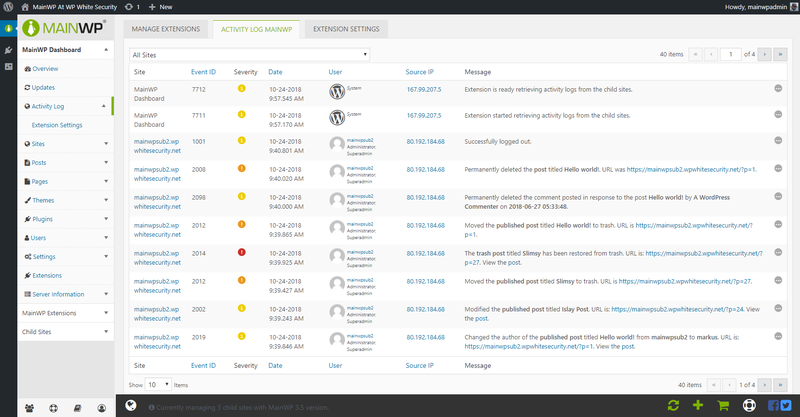 In the wizard you will only see the list of sites that have the WP Security Audit Log plugin installed on them. Click Finish to add the child sites to the central activity logs. Once the child sites are added the extension starts downloading the activity logs from them. By default the extension retrieves the last 100 events from every child site every 3 hours. You can configure the number of events and the download frequency from the extensions settings as explained in Configuring the Activity Log for MainWP extension. Once you login to the MainWP dashboard click the Activity Log menu node to open the activity log of all the child sites and the MainWP dashboard. Use the site drop down menu at the top left of the activity log window to filter the events by site, or for the MainWP dashboard only. Refer to Configuring the Activity Log for MainWP extension for information on how to configure the extension and the activity log display. Refer to the list of MainWP Activity Log events for a complete list of MainWP dashboard changes the extension can keep a log of.